For other uses, see Mountain goat (disambiguation). 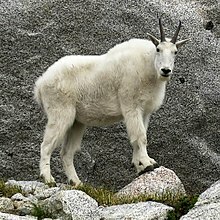 The mountain goat (Oreamnos americanus), also known as the Rocky Mountain goat, is a hoofed mammal endemic to North America. A subalpine to alpine species, it is a sure-footed climber commonly seen on cliffs and ice. Despite its vernacular name, it is not a member of Capra, the genus that includes all other goats, such as the wild goat, Capra aegagrus, from which the domestic goat is derived. The mountain goat is an even-toed ungulate of the order Artiodactyla and the family Bovidae that includes antelopes, gazelles, and cattle. It belongs to the subfamily Caprinae, along with true goats, wild sheep, the chamois, the muskox and other species. Notably, the takins of the Himalayan region, while not a sister lineage of the mountain goat, are nonetheless very closely related and almost coeval; they and the mountain goat are a case of parallel evolution from an ancestral goat. Other members of this group are the Pseudois "blue sheep", the true goats and the Himalayan tahr. The chamois and true sheep lineages are also very closely related, while the muskox lineage is somewhat more distant. The mountain goats probably diverged from their relatives in the late Tortonian, some 7.5 to 8 million years ago. Given that all major caprine lineages emerged in the Late Miocene and contain at least one but usually several species from the eastern Himalayan region, their most likely place of origin is between today's Tibet and Mongolia or nearby. The mountain goat's ancestors thus probably crossed the Bering Strait after they split from their relatives, presumably before the Wisconsinian glaciation. Unfortunately, no Pliocene mountain goats have been identified yet; the known fossil record is fairly recent, entirely from North America, and barely differs from the living animals. In the Pleistocene, the small prehistoric mountain goat Oreamnos harringtoni lived in the southern Rocky Mountains. Ancient DNA studies suggest that this was the sister species of the living mountain goat, not its ancestor; consequently, the living species would also date back to the Pleistocene at least. The mountain goat is the only living species in the genus Oreamnos. The name Oreamnos is derived from the Greek term oros (stem ore-) "mountain" (or, alternatively, oreas "mountain nymph") and the word amnos "lamb". Both billy (male) and nanny (female) mountain goats have beards, short tails, and long black horns, 15–28 cm (5.9–11.0 in) in length, which contain yearly growth rings. They are protected from the elements by their woolly white double coats. The fine, dense wool of their undercoats is covered by an outer layer of longer, hollow hairs. 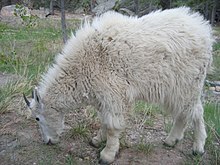 Mountain goats molt in spring by rubbing against rocks and trees, with the adult billies shedding their extra wool first and the pregnant nannies shedding last. Their coats help them to withstand winter temperatures as low as −50 °F (−46 °C) and winds of up to 160 kilometres per hour (99 mph). A billy stands about 1 m (3.3 ft) at the shoulder to the waist and can weigh considerably more than the nanny (around 30% more in some cases). Male goats also have longer horns and longer beards than females. 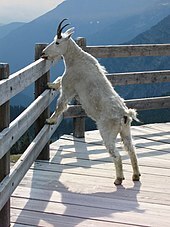 Mountain goats can weigh between 45 and 140 kg (99 and 309 lb), and billies will often weigh less than 82 kg (181 lb). The head-and-body length can range from 120–179 cm (47–70 in), with a small tail adding 10–20 cm (3.9–7.9 in). The mountain goat's feet are well-suited for climbing steep, rocky slopes with pitches exceeding 60°, with inner pads that provide traction and cloven hooves that can spread apart. The tips of their feet have sharp dewclaws that keep them from slipping. They have powerful shoulder and neck muscles that help propel them up steep slopes. The mountain goat inhabits the Rocky Mountains and Cascade Range and other mountain regions of the Western Cordillera of North America, from Washington, Idaho and Montana through British Columbia and Alberta, into the southern Yukon and southeastern Alaska. Its northernmost range is said to be along the northern fringe of the Chugach Mountains in southcentral Alaska. Introduced populations can also be found in such areas as Idaho, Wyoming, Utah, Nevada, Oregon, Colorado, South Dakota, and the Olympic Peninsula of Washington. Mountain goats are the largest mammals found in their high-altitude habitats, which can exceed elevations of 13,000 feet (4,000 m). They sometimes descend to sea level in coastal areas although they are primarily an alpine and subalpine species. The animals usually stay above the tree line throughout the year but they will migrate seasonally to higher or lower elevations within that range. Winter migrations to low-elevation mineral licks often take them several kilometers through forested areas. Daily movements by individual mountain goats are primarily confined to areas on the same mountain face, drainage basin, or alpine opening. Daily movements reflect an individual's needs for foraging, resting, thermoregulation and security from predators or disturbance. Seasonal movements primarily reflect nutritional needs (e.g., movements to and from mineral licks/salt lick), reproductive needs (i.e., movement of pre-parturient females to "kidding" areas; movement to rutting areas), and climatic influences (i.e., movement to areas in response to foraging conditions). In general, seasonal movements are likely to exhibit a strong elevational component, whereby lower, forested elevations are used during the spring-summer (security cover effects) to access lower elevation mineral licks, and during winter (thermal cover effects) to access forage. The farthest movements are expected to be by dispersing mountain goats. Such movements are likely to involve mountain goats crossing forested valleys as they move between mountain blocks. Mountain goats are herbivores and spend most of their time grazing. Their diets include grasses, herbs, sedges, ferns, mosses, lichens, and twigs and leaves from the low-growing shrubs and conifers of their high-altitude habitat. In captivity, the mountain goat's diet can also include grain, alfalfa, fruits, vegetables and grass. In the wild, mountain goats usually live 12 to 15 years, with their lifespans limited by the wearing down of their teeth. In zoos, however, they can live for 16 to 20 years. Mountain goats reach sexual maturity at about 30 months. Nannies in a herd undergo synchronized estrus in late October through early December, at which time males and females participate in a mating ritual. Mature billies stare at nannies for long periods, dig rutting pits, and fight each other in showy (though occasionally dangerous) scuffles. Young billies sometimes try to participate, but they are ignored by nannies; nannies also sometimes pursue inattentive billies. Both males and females usually mate with multiple individuals during breeding season, although some billies try to keep other males away from certain nannies. After the breeding season is over, males and females move away from each other, with the adult billies breaking up into small bands of two or three individuals. Nannies form loose-knit nursery groups of up to 50 animals. Kids are born in the spring (late May or early June) after a six-month gestation period. Nannies give birth, usually to a single offspring, after moving to an isolated ledge; post partum, they lick the kid dry and ingest the placenta. Kids weigh a little over 3 kilograms (6.6 lb) at birth and begin to run and climb (or attempt to do so) within hours. Although they are mostly weaned within one month, kids follow their mothers closely for the first year of life (or until the nanny gives birth again, if this does not occur the next breeding season); nannies protect their young by leading them out of danger, standing over them when faced by predators, and positioning themselves below their kids on steep slopes to stop freefalls. Nannies can be very competitive and protective of their space and food sources. They fight with one another for dominance in conflicts that can ultimately include all the nannies in the herd. In these battles, nannies circle each other with their heads lowered, displaying their horns. As with fights between billies during breeding season, these conflicts can occasionally lead to injury or death, but are usually harmless. To avoid fighting, an animal may show a posture of nonaggression by stretching low to the ground. In regions below the tree line, nannies use their fighting abilities to protect themselves and their offspring from predators. Predators, including wolves, wolverines, lynxes, and bears, attack goats of most ages given the opportunity. The cougar is perhaps the primary predator, being powerful enough to overwhelm the largest adults and uniquely nimble enough to navigate the rocky ecosystem of the goats. Though their size protects them from most potential predators in higher altitudes, nannies must sometimes defend their young from golden eagles, which can be a predatory threat to kids. Nannies have even been observed trying to dominate the more passive, but often heavier bighorn sheep that share some of their territory. 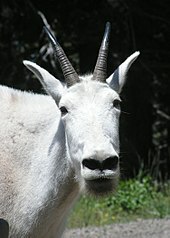 Mountain goats can occasionally be aggressive towards humans, with at least one reported fatality resulting from an attack by a mountain goat. Although mountain goats have never been domesticated and commercialized for their wool, pre-Columbian indigenous peoples of the Pacific Northwest Coast did incorporate their wool into their weaving by collecting spring moulted wool left by wild goats. ^ Festa-Bianchet, M. (2008). "Oreamnos americanus". The IUCN Red List of Threatened Species. IUCN. 2008: e.T42680A10727959. doi:10.2305/IUCN.UK.2008.RLTS.T42680A10727959.en. Retrieved 12 January 2018. Database entry includes a brief justification of why this species is of least concern. ^ "Goat Hunting in Alaska". alaska.gov. Alaska Department of Fish and Game. Retrieved 13 December 2015. ^ a b Oreamnos americanus. Animal Diversity Web. Retrieved on 2012-07-24. ^ Lewinson, Ryan T.; Stefanyshyn, Darren J. "A descriptive analysis of the climbing mechanics of a mountain goat ( Oreamnos americanus )". Zoology. 119 (6): 541–546. doi:10.1016/j.zool.2016.06.001. ^ "Mountain Goats". North Cascades National Park Service Complex. National Park Service. Retrieved 21 October 2010. ^ D. Chadwick (1983). A Beast the Color of Winter – The Mountain Goat Observed. Sierra Club Books. San Francisco. 208 p.
^ Hamel, Sandra; Côté, Steeve D. (2009). "Maternal defensive behavior of mountain goats against predation by Golden Eagles". Western North American Naturalist. 69 (1): 115–118. ISSN 1527-0904. ^ Hiker killed by mountain goat in Olympic Nat'l. Park. seattlepi.com (2010-10-16). Retrieved on 2011-09-15. M. Festa-Bianchet and S.D. Côté (2008). "Mountain Goats: Ecology, Behaviour and Conservation of an Alpine Ungulate". Island Press. ISBN 978-1-59726-170-8. 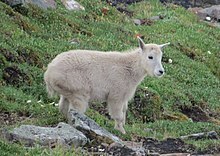 265 p.
Wikimedia Commons has media related to mountain goat.